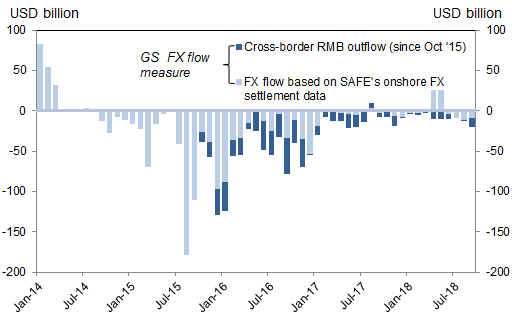 According to the latest data from China's SAFE, net FX outflows from China picked up to US$21BN in September (vs. US$11BN in August) and the highest since mid-2017 with Goldman noting that "outflow might have increased moderately further in October, but has unlikely reached the level seen in late 2015/early 2016 in our view." And, to counter the risk of a return to China's dramatic outflow phase, Reuters writes this morning that China is likely to resume selling some of its vast $3 trillion currency reserves to stop any precipitous fall through the psychologically important level of 7 yuan per dollar "as it could risk triggering speculation and heavy capital outflows." 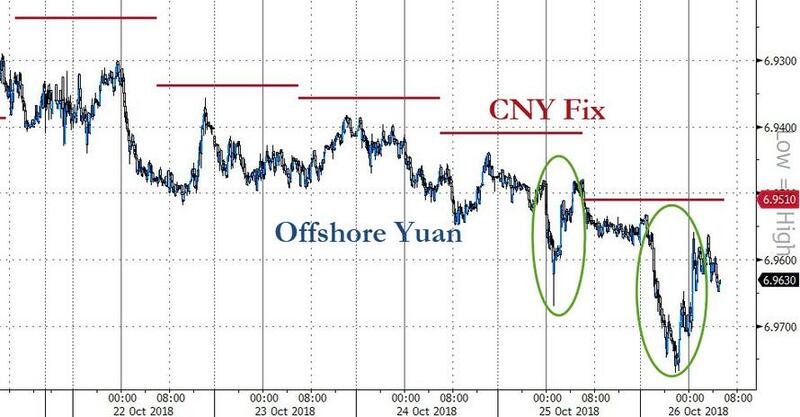 According to Reuters, to counter any potential spike in outflows, "a defense of the yuan at 7 per dollar would be mounted to show investors that the authorities wouldn’t allow a runaway market." And, according to a second Reuters source, should the Yuan hit 7.00 against the dollar, the PBOC would make a stand, rather than allow any sudden break through a psychologically important level to feed pessimism among investors. “The central bank will intervene - intervene directly or indirectly. It’s necessary. The central bank has many policy tools. We cannot let the yuan fall past 7, as it would have a psychological impact on people,” the second source said. That said, China is now juggling two opposing tasks, with Beijing’s priority now to ward off a sharper slowdown in the economy, which grew only 6.5% in the third-quarter, while at the same time it is worried about the impact of the weaker currency on capital outflows. To address the slowing economy, the central bank has cut reserve requirements for lenders four times this year, and is expected to ease monetary policy further, while on the fiscal side the government has pledged more tax cuts next year to support growth. Those actions, however, have caused the yuan to weaken to just shy of a decade low. Should the PBOC loosen monetary policy further to depreciate the yuan more in order to bolster sagging economic growth, policymakers will be on guard against spooking markets as the exchange rate nears 7 per dollar, a third Reuters source said. The good news is that if China does revert to its currency defense posture from 2015/2016, when it burned through $1 trillion in reserves to halt outflows, it still has a sizable cushion, even if as noted last week, they have started to decline again: as a result, traders are closely watching to see if China’s foreign currency reserves fall below $3 trillion, having slipped to $3.087 trillion last month. Specifically, reserves fell $52.9 billion in the first nine months of 2018 - with 43% of the drawdown happening in September, but the scale of the decline is dwarfed by a record annual drop of $512.7 billion in 2015, showing the authorities have been far less interventionist. Meanwhile, and as one would expect, capital outflows have picked up as the yuan moves closer to the key 7 per dollar level, with net foreign exchanges sales by China’s commercial banks rose to $17.6 billion in September, the highest in 15 months. That number will only rise as the Yuan weakens further, sparking the same dynamic that was observed in the months ahead of the Shanghai Accord in early 2016. Meanwhile, so far this year, Chinese policymakers have been less interventionist on the yuan than they were in 2015, as a weaker currency helps cushion a slowing economy and take some of the sting out of higher U.S. tariffs, even though Beijing has rejected talk that it’s deliberately pushing down the yuan to spur exports. 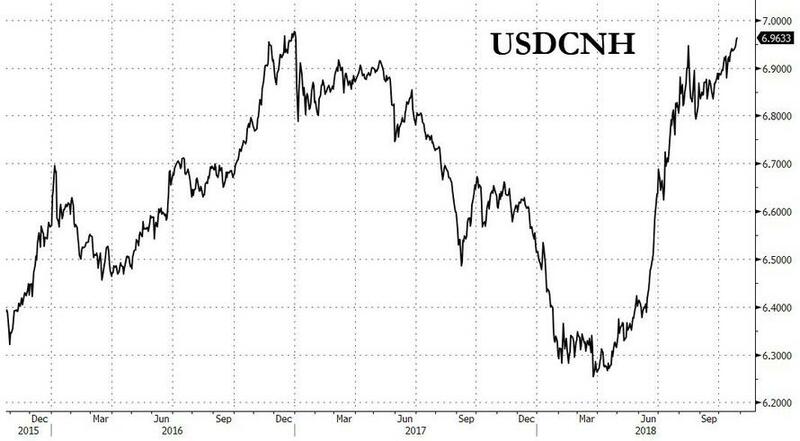 The good news is that should China engage in a full-blown defense of the Yuan, Trump will be happy as it will mean his crusade to stop Beijing's "devaluation" of the Yuan will have succeeded. The US president may not be so happy however, if the selling of hundreds of billions of USD-denominated assets leads to an acceleration in the global market rout, in a repeat of what happened in early 2016 when global market tumbled sharply and only coordinated intervention from the world's central bankers prevented a global bear market. Trump will most certainly not be happy if a sudden dump of US Treasurys by Beijing results in a sharp spike higher in US interest rates. And now that China has set an intervention "trigger" bogey, FX traders will quickly test just how serious Beijing truly is. Expect the USDCNH to hit 7.00 in days, if not hours. What happens after could set the tone for risk returns for a long time.